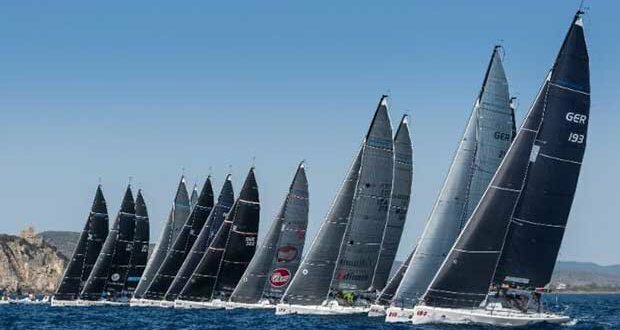 The 2018 Melges World League, European Division season for the Melges 20 and the Melges 32 will officially start tomorrow on the island of Forio d’Ischia in Italy. The Melges 32 will open the back-to-back weekends of racing, while the Melges 20 will conclude the first chapter on April 20-22. It will be a first for both fleets on the Forio d’Ischia racing field. The new venue stirs a lot of curiosity for Melges 32 teams, seasoned and novice alike. Every team is anxious to know just how intense the 2018 season will be, especially with a World Championship title being awarded in Cagliari at the very end in October. There will be a great deal of evaluation to define the hierarchies, the values of strength and above all – how to best gain the points needed to win the Melges World League Championship Series overall. Their biggest and brightest competition involves the usual suspects such as European Champion Vincenzo Onorato’s MASCALZONE LATINO (who has employed the tactical expertise of Olympic medallist, multiple Melges Class World Champion and three-time Moth World Champ Paul Goodison), and Matteo Balestrero at the helm of GIOGI (with Branko Brcin as tactician). There is also Christian Schwoerer’s LA PERICOLOSA (with the Frenchman Sebastian Col in the cockpit), Fritz Homann’s WILMA with the celebrated Nico Celon on tactics, Jens Kuehne (Jens Van Der Biest, tactician), the young Corinthian team of HOMANIT with Kilian Holzapfel at the helm, and Norway’s Lasse Pettersen (with Matteo Ivaldi as tactician) on PIPPA that anticipate victory as well. One of the main highlights of the forthcoming 2018 season is a wave of new owners who will make their Melges 32 Class debut appearance in Forio. From Poland comes the challenge of Waldemar Salata at the helm of CASINO ROYAL. Two brand new Italian entries will be racing – Manfredo Toninelli at the helm of an Corinthian T.ONE, and DON INO of Luigi Giannattasio (Andrea Racchelli, tactician), and also SKADI, an entry of the Swiss-based Associazione GUST-PAR.